Need a basketball fast? View our Quick-Ship Basketballs! 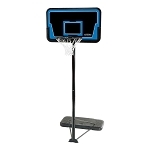 Low Price Guarantee on our Lifetime Portable Basketball Goals & Hoops - Call us if you find a lower price. Basketball Portable Goals Include Top to Bottom Lifetime 5 year limited warranty from the manufacturer. Lifetime portable basketball systems allow you to move your system around for ideal playing areas and to store away when not in use. Need help with assembly of your portable basket ball hoop? 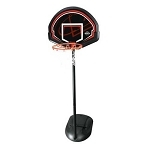 Why purchase Lifetime Portable Basketball Hoops over other Portable Basketball Goals? 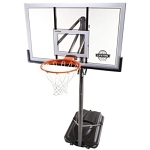 A portable basketball hoop from Lifetime Products typically provides a better warranty. 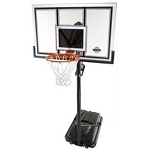 Lifetimes 5-year warranty give you more long term security for you portable basketball goal than the 1 to 3 year warranty from Spalding for comparable specs on their basketball systems. Because of this added guarantee, you can rest assured that your Lifetime basketball system has a better construction and quality than other competing portable basketball systems. Lifetime Products also manufactures an excellent line of Pool Basketball systems. Please note that all of these products have a warranty directly from Lifetime Products, the manufacturer. Most of the product listings should have the warranty length available. The manufacturer typically warranties these systems for 5 years. If you need help with a warranty claim, you can contact the manufacturer at 1-800-225-3865 to do so. For more helpful info also visit our sitewww.theportablebasketball.com.